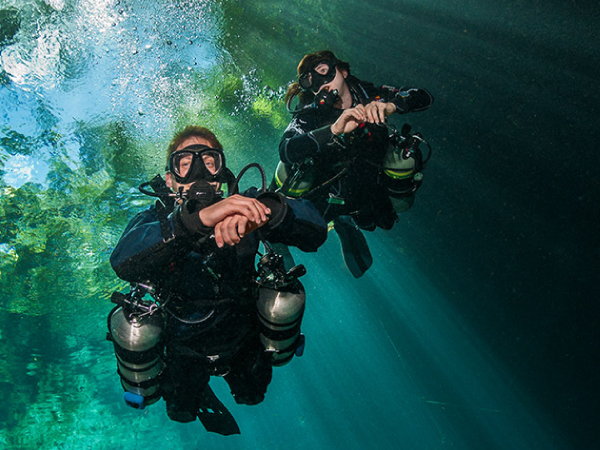 The new PADI Sidemount Diver Specialty course teaches divers how to configure and use one or two cylinders mounted at their sides instead of on their backs. 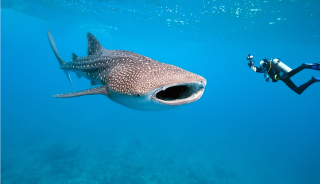 This specialty is recreational in scope, including no-stop dives. 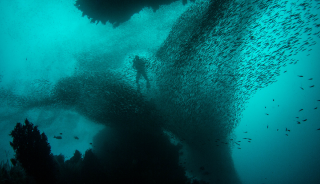 Maximum depth 18-30 meters/60-100 feet, depending on diver training/experience. Most sidemount configurations allow a diver to fine tune equipment fit and trim during the dive to enhance streamlining and body position. Using side mounted cylinders can reduce drag and help to better control environmental contact when compared with using back mounted twin cylinders. 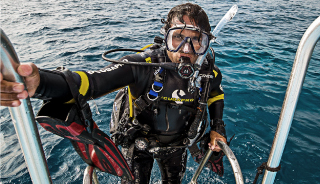 A diver has easy access to the regulator first stage(s) and tank valve(s) during the dive, because they’re positioned in front of the diver instead of behind the diver’s head. Divers with back problems may find relief by mounting cylinder(s) on their sides. Divers who have challenges supporting cylinder weight out of the water may find side mounted cylinder(s) simpler to use and easier to put on in the water. With two-cylinder sidemount, a diver can handle a low or out-of-gas problem by switching to the second cylinder. With two cylinder sidemount, a diver can handle a regulator failure by switching to the second regulator. Carrying two smaller cylinders can be easier than carrying one large cylinder (or backmounted twin cylinders) to and from the dive site. For divers who run out of gas long before approaching no decompression limits, side mounted cylinders provide a comfortable option to increase air supply and maximize bottom time; especially when using enriched air. 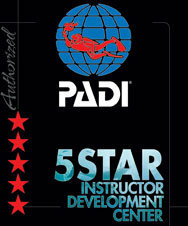 Do you have questions about the PADI Sidemount Diver Course?